Adnoviv/UH awarded $750k grant from the National Science Foundation for smart-building occupancy detection technology. 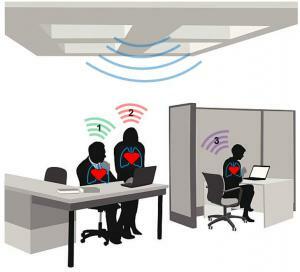 The TruPODS system senses the presence and number of people in a room, even if they are very still. HONOLULU, HAWAII, UNITED STATES, October 24, 2018 /EINPresswire.com/ -- Adnoviv LLC has been awarded a National Science Foundation (NSF) Small Business Technology Transfer (STTR) Phase II grant for $750,000 to commercialize innovative technology by conducting research and development (R&D) on low-cost sensors capable of real human presence detection and occupant monitoring, in partnership with the University of Hawaii. Occupancy detection systems are used in smart buildings to improve energy efficiency by cycling lights, proactively adjusting ventilation and temperature, and providing data for energy management systems. Adnoviv is combining wireless communication circuitry with advanced algorithms developed by researchers at the University of Hawaii’s Department of Electrical Engineering, to make True Presence Occupancy Detection Sensors (TruePODS), a system that uses Doppler radar to recognize cardiopulmonary motion. TruePODS can sense the presence and number of individuals, even if they are very still, and without raising privacy concerns. To contact Adnoviv, email info@adnoviv.com. About the National Science Foundation's Small Business Programs: America’s Seed Fund powered by the National Science Foundation (NSF) awards nearly $200 million annually to startups and small businesses, transforming scientific discovery into products and services with commercial and societal impact. Startups working across almost all areas of science and technology can receive up to $1.5 million in non-dilutive funds to support research and development (R&D), helping de-risk technology for commercial success. America’s Seed Fund is congressionally mandated through the Small Business Innovation Research (SBIR) program. The NSF is an independent federal agency with a budget of about $7.5 billion that supports fundamental research and education across all fields of science and engineering Small businesses with innovative science and technology solutions, and commercial potential across almost all areas of technology are encouraged to apply. All proposals submitted to the NSF SBIR/STTR program undergo a rigorous merit-based review process. NSF’s deadlines for Phase I small business proposals occur twice annually, in June and December. About Adnoviv: Adnoviv LLC is a research-driven technology company developing innovative sensors and systems for industrial, medical, and security applications. The centerpiece of Adnoviv’s product pipeline is the TruePODS line of high-performance occupancy detection systems for smart buildings and energy conservation. The Adnoviv team is comprised of world-experts in non-invasive physiological sensors, experienced in engineering research and product development. Adnoviv is headquartered in Honolulu, Hawaii.